Are you really just feeling frustration and anger? What’s hiding under men’s anger? Home » What’s hiding under men’s anger? Do you know which are the most commonly recognised emotions for many men? When I consult with blokes, many present their first emotional responses to a myriad of challenges in life. Often it’s expression of frustration and anger. Does ‘frustration’ and ‘anger’ alone sum up the full experience of these significant problems? I think it’s only half the emotional story! Whilst feeling frustrated or angry is a recurring part of a man’s emotional repetoire, there are many guys who feel a little short changed when it comes to making sense of their problems though these feelings alone. This is because being frustrated and angry is rarely enough to soothe the pain. Most importantly, these feelings can add more shame, and then more frustration and anger! Other feelings often accompany frustration and anger. They bubble away under the surface. However, they need more attention. Recognising the underlying feelings behind frustration and anger significantly helps men heal their wounds. What’s underneath your frustration or anger? There are many possibilities. Below are a few. It may seem a tad daunting looking at the list above. 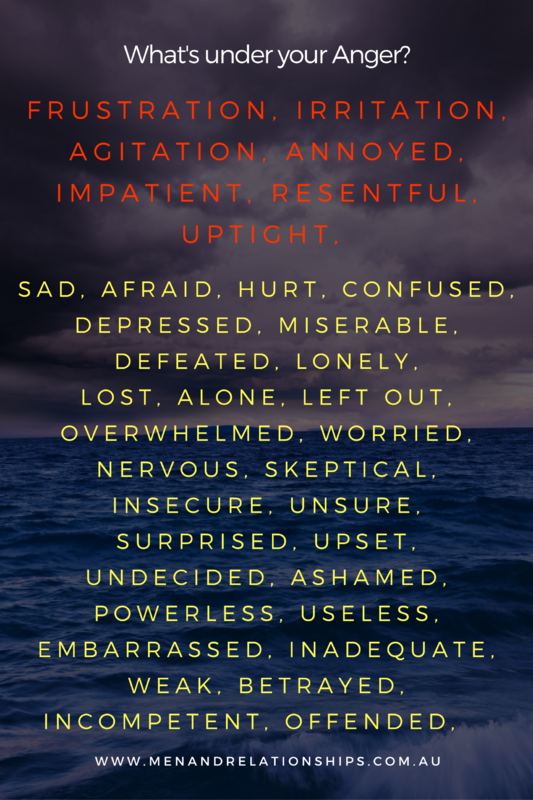 Do you notice how these feelings are kind of ‘layered’? When you’re feeling frustrated or angry check in with what else is going on underneath. Struggling with any of this?